This cabin is a two-story, authentic red cedar log cabin nestled in a cozy cove in a private community in the Smoky Mountains. It is located on one and one-half acres five miles from downtown Murphy. Easy access year round. It features hardwood floors, two bedrooms (one loft), and a spacious great room with high-vaulted ceiling, kitchen, dining, and bath. Relax to the sounds of the running spring-fed stream and waterfall. The split-level redwood deck overlooks the trout pond. Also within a very short walking distance to the Nottely River and another community lake for picnicing, swimming, and fishing. There is also a large lot across the street from the cabin that has direct, personal access to the Nottley River with a private deck, and stairs down to the Nottley River. Electric fireplace stove inside. Deck on Nottley River with steps leading down to river on large cleared lot with fire pit. Renters may use large catch and release pond in neighborhood. 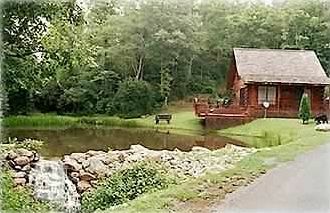 No fishing license required while fishing in the closed community . really enjoyed the layout,simple ,but comfortable.Everything was great,Renewed my ongoing interest in the log cabin. Forgot my fishing rod ,but discovered it wasn't of use. We really enjoys our stay at the cabin! I'm sure we will be going back when we can stay longer. Cabin was cute. Furnishings were not comfortable so we had to cut our time short. The best part was sunning on the deck reading a book with the sounds of the waterfall in the background. We thought the cabin was just adorable and in a lovely setting. Would have loved a fireplace. It was so cold outside. Pet Friendly , extra (fully refundable) pet security fee of 100. We ask that pets be kept off furniture and bedding and that they are crated if left unattended.